Originally discovered by the Portugese Tristao d'Acunha in 1506, it remained uninhabited for the next three centuries. Interestingly, a group of Americans first settled on the island in 1810 naming it the Isle of Refreshment. The Royal Navy took an interest in the island when Napoleon was deposited on the, relatively for the Atlantic, near island of St Helena. The garrison was withdrawn in 1817 but some of its members remained behind to form the nucleus of a small self-sustaining community. These included Corporal William Glass who became known as 'The Governor'. Others joined William Glass and his family over the next few years. Five bachelors on Tristan in the early 1820s asked a naval Captain if he could arrange for five wives to come from St. Helena. 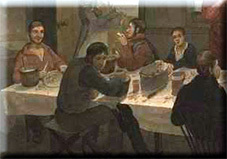 In 1827 the ladies arrived and the community began to increase. In 1836 a Dutchman, Peter Groen, who anglicised his name to Green, joined them. In 1837 and 1849 Thomas Rogers and Andrew Hagan, both American whalermen, also settled on Tristan. By 1856 there were 96 inhabitants. However the decline in whaling, the transition to steam ships and the opening of the Suez Canal, all occurring at around the same time, stalled Tristan's growth. Many inhabitants emigrated to the USA and Cape Town and the Island was forgotten apart from occasions when the remaining islanders rescued shipwrecked sailors. It was partly in recognition of this help and the activities of missionaries that the British Government in 1876 formally declared the islands to be part of the British Empire. An annual visit by a British warship to bring supplies was started. 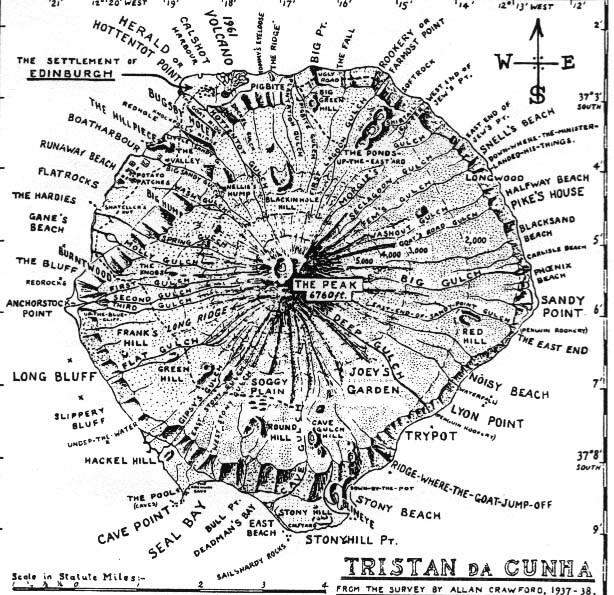 By 1886 there were 97 inhabitants, clustered at the settlement of Edinburgh on Tristan da Cunha. 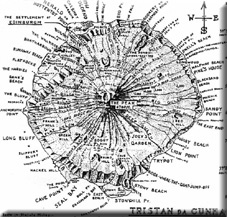 In 1938, the colony was brought under more formal control from St Helena. From August 1961 there were signs that the Tristan volcano was restless. There were earth tremors and in the following months a large fissure opened in the ground behind the island's lighthouse and a mound formed that gave off a powerful smell of sulphur and grew steadily larger. The island's 264 people moved to the uninhabited Nightingale Island for an uncomfortable night before a Dutch liner, the Tjisadane, that happened to arrive the next day, took them away to Cape Town. HMS Leonard arrived from the Cape on October 13th to find that red-hot lava and smoke were pouring out of the mound, which was 250ft (80m) high. The crew collected as many of the islanders' belongings as they could before sailing back to South Africa, but all the farm animals and domestic pets had to be left behind. The islanders were soon taken on to England on a mail ship, the Stirling Castle. After a brief spell in wooden huts in Surrey, they were housed at a former RAF camp at Calshot, near Southampton, where they suffered unhappily through an unusually cold English winter. A Royal Society expedition in 1962 found that, although the Tristan crawfish cannery was no more and the islanders' dogs had taken a heavy toll on the sheep, conditions seemed not impossible. An advance party returned to Tristan in April 1963 and in November some 200 people, including four Tristan girls who had meantime married Englishmen, returned to their island. The island is still a Crown Dependency to this day. A Missionary's account of his time on the Island. Published in 1856.